In this study we analysed the imaging patterns in two families containing five members with asymptomatic and uncomplicated autosomal dominant osteopetrosis (ADO II), and we report new and uncommon radiological manifestations. These findings might be useful in the context of reducing the incidence of fractures and other orthopaedic complications. Diffuse pelvic sclerosis on radiographs was observed incidentally in two patients. Both cases were asymptomatic, and the patients had never suffered a fracture. The suggestion of ADO II was raised. A detailed medical history, an imaging survey, and a haematological study were obtained so that other rare causes of osteosclerosis could be ruled out. No genetic study was conducted. All their first-degree relatives were also examined. Bony sclerosis was observed in five patients, and the radiological findings were analysed. A not previously reported thickening of the skull base without cranial nerve palsy or optic nerve atrophy was revealed in all patients. Scoliosis was present in three of them. This has been reported previously only once in ADO II. No lower limb deformity was detected. 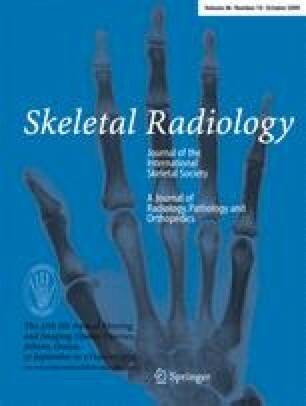 This study provided information on the pattern of radiological features in familial asymptomatic ADO II. These data on new and rare imaging findings will increase the diagnostic awareness of physicians and will guide a thorough investigation of the entire family. This might result in a consequent decrease in the incidence of fractures and other orthopaedic complications.